A pretty severe heat wave is gripping most of the east coast about now. With the help of some other internet sites, I modified a design for a kid's water table that makes a great, cheap way to have hours of fun and stay cool at the same time. Tools needed: a jigsaw. You could probably do it with a hacksaw, but it would take a lot longer. - A 41 quart Sterilite tub. Other tubs are certainly usable, but they would change the dimensions from what I'm about to describe. The 41 quart tubs are great for water tables, moon sand, regular sand ... the possibilities are endless. 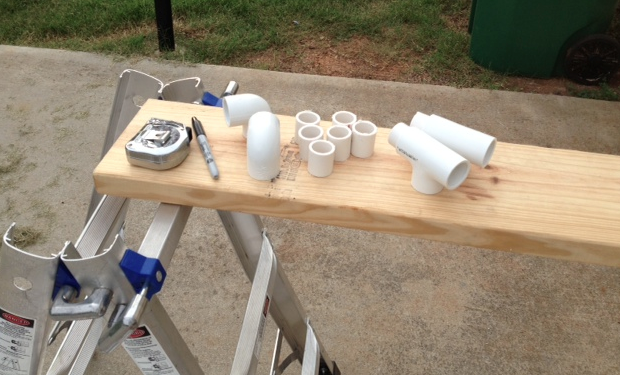 It really helps to make two lines on the PVC pipe as you're marking it for cutting; it gives you a better line to follow when you're cutting. It helped me to label, with a piece of masking tape, the 11 and 14.5" pieces. They're close enough that they're easy to confuse. 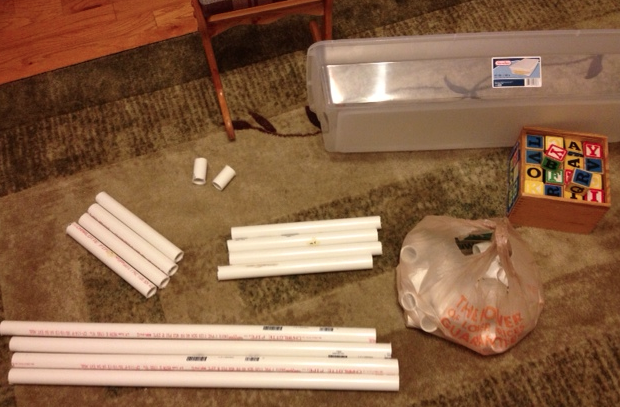 The 11" pieces make the legs, and the 14.5" pieces make the "ends" that hold up the tub. Theoretically, there's supposed to be 1" of overlap between a fitting (like a T or an elbow) and a pipe, meaning the little connectors could theoretically be 2" long. But friction really works against you when cramming PVC together, and 1.5" is plenty of overlap. 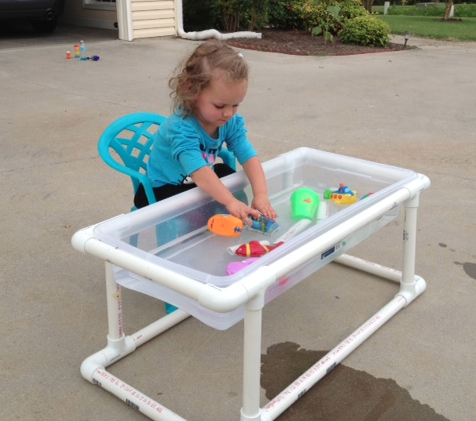 Assemble everything together, and have fun with your new water table!!! You could glue the PVC together for added stability and permanence. But as it is, it's rock-solid and I like the possibility of taking it apart someday. The 11" legs are just barely tall enough. You could go to 12 or 13 inches and it might be better for bigger kids. The setup was sturdy enough to easily support Beth lying in the tub (before we filled it with water), and she weighs about 28 pounds now.